Stanford finished in 3rd place at the Hawaii tournament played at Waikoloa Beach Resort's Kings Course on the Big Island, 10 shots behind top-ranked Texas and 5 behind USC. It took a strong 11-under par final round of 277, equal to the best of the day to move the Cardinal ahead of Georgia Tech and UCLA. In a field with 6 of the nation's top 10 teams, the Pac-12 finished 2nd, 3rd, 5th, 7th, 8th, 12th and 17th in the field of 20 teams. The Cardinal finished ahead of the nationally 2nd ranked Oregon and the nationally 4th ranked UCLA. Stanford came into the event ranked 7th in the country. See Assistant Coach Phil Rowe's comments on the event below --- Head Coach Conrad Ray was home waiting for their third child. The Cardinal was led by super-frosh Patrick Rodgers (67-69-71, 9-under 207) who finished 3rd individually, two strokes behind Jordan Spieth of Texas and Jeffrey Kang of USC. Patrick has now finished in the top ten in each of his tournaments this season. 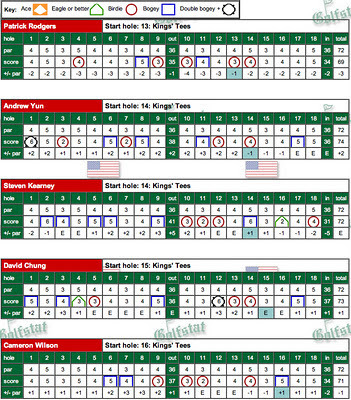 One shot behind was returning 1st team All-American and junior Andrew Yun (69-74-65 208) who had the tournament low round of 65 in a blazing display that included an amazing 3 eagles on his front nine (more about this historic feat below). Senior co-captain David Chung finished tied for 23rd with rounds of 70-73-70 (213), sophomore Cameron Wilson tied for 49th with 76-71-71 (218) and fellow sophomore Steven Kearney tied for 65th with 76-72-72 (220). Freshman Patrick Grimes, playing as an individual, led the event after an opening 66 and finished tied for 35th with 66-75-74, a 215 total. Stanford was 12 strokes behind Texas after the first round and played the best of any team over the last two rounds to move up from 6th place to 3rd. A fast close on the final hole of each player's final round proved the difference as our 5-person team together was 4-under par behind David Chung's final hole eagle and 2 other birdies to move ahead of Georgia Tech by 1 shot and UCLA by 2 shots. Andrew Yun's final round 65 (on nines of 31-34) as mentioned above was the lowest of the tournament, tied with one other player. He began his historic round on the par 5 4th hole with an eagle and then proceeded to eagle his second hole, the par 4 5th hole. After a double bogey on 6, his round continued with 5 more birdies and another eagle on his 17th hole, the par 5 2nd hole. So the round included 5 birdies, 3 eagles, 2 bogies, a double bogey and only 7 pars. The 3 eagles in 4 holes may never have been accomplished by any golfer anywhere. On the pro tour, the last player to record 3 eagles in one round (not 9 holes) was Joe Ogilvie in the 2007 Fry's Open. Truly an historic round by Andrew. 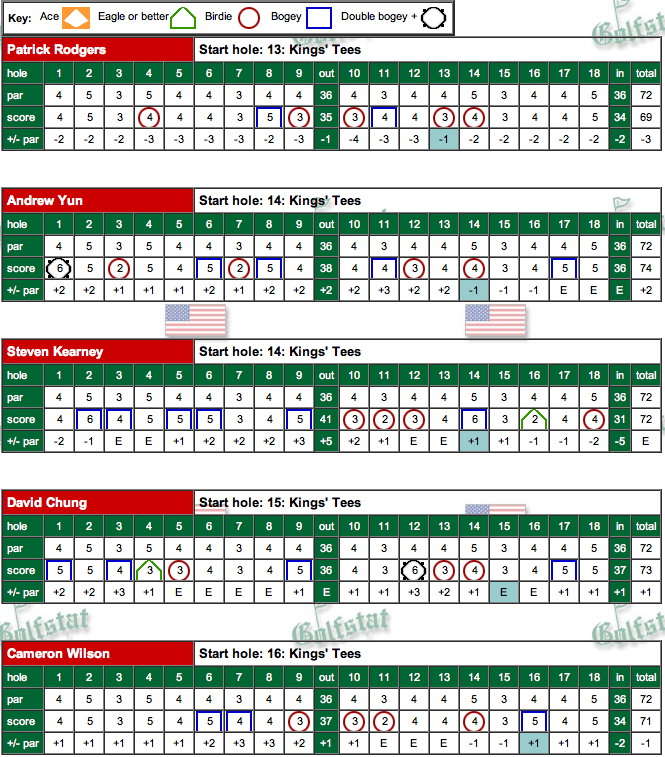 The final round scorecards are shown below - click to enlarge. Assistant Coach Phil Rowe's comments after the event --- It was hard to keep up with all the action even from close up since there were so many birdies and eagles flying around there. I watched Steven Kearney hole out his wedge shot on hole 16 in the second round and also managed to see the two opening back to back eagles on holes 4 and 5 from Yun. From just looking at the scorecard it looks as though Andrew was -7 for 5 holes!!! We played relatively better on each day. as you noted, we put ourselves a bit too far behind following round 1 and those strong teams were just not going to relinquish such a lead. not all of them at least. Every day was a story of promising starts, a lull in the middle and then a strong finish. The strong finish was incredible to experience first hand. 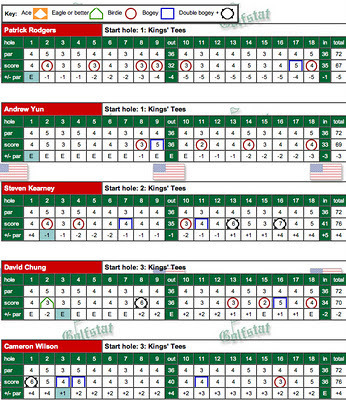 I watched Kearney finish with a birdie, Cameron finish with back to back birdies, Chung with an eagle (-4 for last four) and then there was Yun who was -4 for his last four also!! the swirling windy conditions that made some parts of the course open for attack and others where a defensive par was the play. Fortunately all the conditions came right for us to overtake UCLA and Georgia Tech. 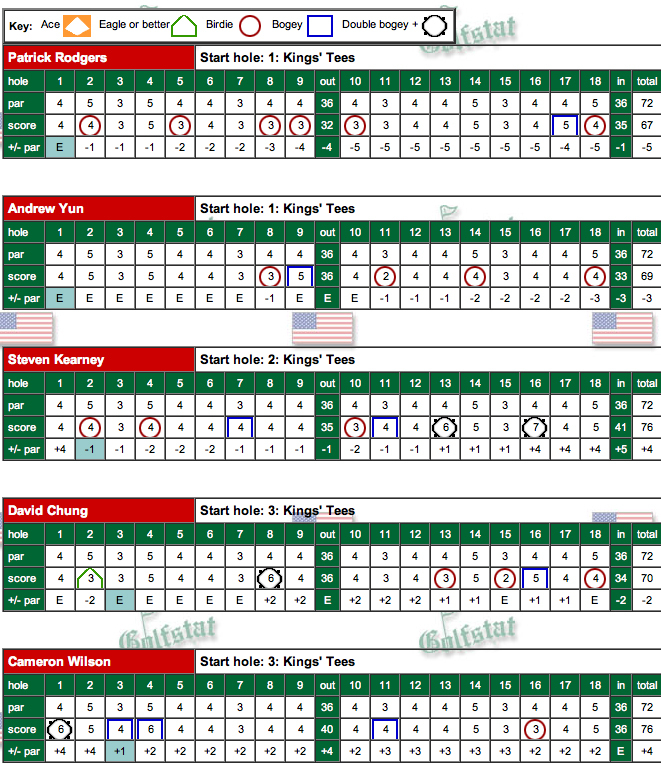 For a moment I thought Rodgers was going to bring home the individual title too since birdies on holes 18 and 1 got him right back in the mix and tied with Speith and Kang at that point. Unfortunately he was in between clubs on his second shot to the par 5 second hole and paid a hefty price for pulling his shot left into the hazard that would ruin his chances of a second collegiate win that will surely come along as a result of being in contention on an every tournament basis! Lot's to learn from this time around. Other than that we had a fantastic week as always warmly hosted by Irv and Sukey Grousbeck, star supporters of the program. There's a rapid turn around for San Diego so we are busy planning and working out the starting 5 for that one. Meanwhile, still no baby chez Ray! Stanford moved up one spot to a tie for 5th place after a solid 3-under par 285 2nd round total on a day when the wind blew on the Kona side of the Big Island in Hawaii - this 2nd round for Stanford was tied for 2nd best on the day. Texas remains in the lead 10 shots ahead of the Cardinal, with UCLA, USC and Washington holding down the next 3 spots. Patrick Rodgers once again led the way for the team with a 3-under 69 (67-69) leaving him tied for 2nd individually only one shot behind the leader from UCLA. 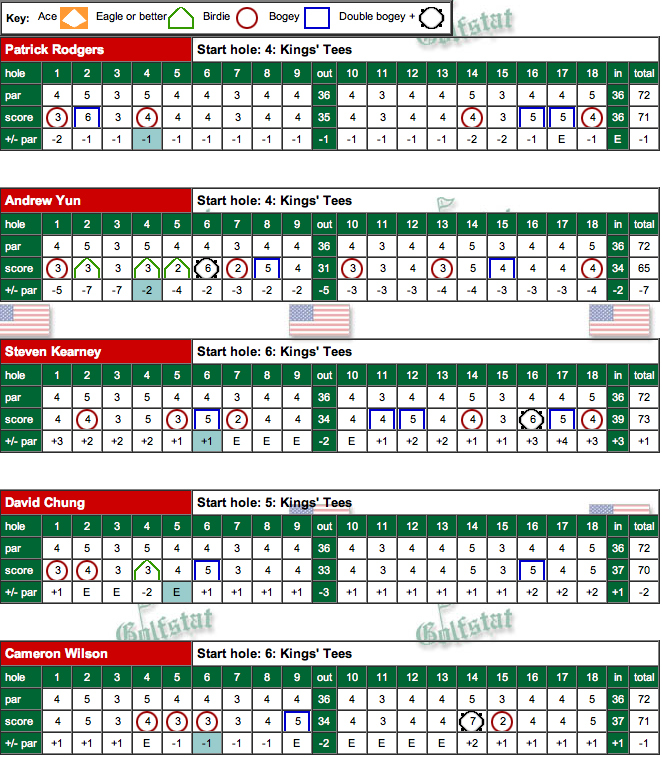 Andrew Yun (69-74) and David Chung (70-73) are tied for 30th individually while Cameron Wilson (76-71 65th) and Steven Kearney (76-72 T66) both had solid 2nd rounds in the tougher conditions. Patrick's solid round featured 5 birdies and two bogies and both Steven and Cameron had good back nines leading to their 71-72 respectively. Steven's superb back nine of 5-under 31 was especially noteworthy as he had 4 birdies and an eagle 2 on the par 4 16th hole to offset a lone bogey on the par 5 14th. Freshman Patrick Grimes, playing as an individual, after leading the event in round one with his 6-under 66 had a 75 leaving him tied for 21st position. The Cardinal is in 6th place, 12 shots behind leading and top-ranked Texas after round one of the 20 team Ari Invitational played on the Big Island of Hawaii at the Waikoloa Beach Resort's Kings Course. Three Pac-12 teams, UCLA, Washington and USC are ahead of Stanford and Oregon is 2 shots behind the Cardinal. Live scoring is available by Golfstat. Freshman Patrick Rodgers, the nation's 4th ranked collegiate player, led the team's play with a 5-under 67 (T4) in a round that included 6 birdies and a lone bogey. Andrew Yun had a 69 (T15), David Chung a 70 (T26) while sophomores Stephen Kearney and Cameron Wilson had matching 76's (T93). 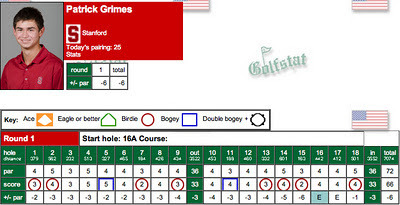 Freshman Patrick Grimes, playing as an individual, had a great round of 66 and is tied for 1st in the field. His round featured 8 birdies. 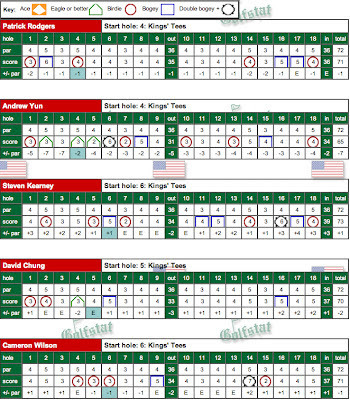 Scorecards for the team players and Patrick are showed below --- click to enlarge. 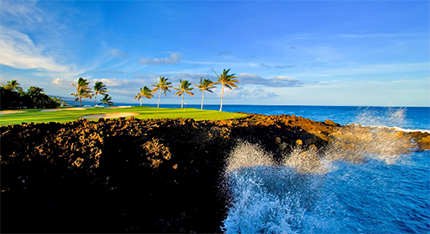 STANFORD, Calif. -- - Stanford's men's golf team, ranked seventh by Golfweek, will open its spring season on Wednesday at the Amer Ari Invitational, where six of the top 10 teams in the nation will vie for the team title at the Waikoloa Kings' Course on the Big Island. Top-ranked (Golfweek/Sagarin) Texas, No. 2 Oregon, No. 4 UCLA, No. 9 Georgia Tech and No. 10 Washington, along with No. 7 Stanford, headline the field which also includes Pac-12 rivals Arizona State, Colorado, Oregon State and No. 11 USC. Oklahoma State, Cal-State Chico, TCU, Texas Tech, UC Davis, Hawaii-Hilo, Hawaii-Manoa, San Jose State, San Francisco and Osaka Gakuin University from Japan round out the field. Stanford finished tied for 11th in last year's event but has captured the team title three times in the last five years, finishing first in 2007, '08 and '10. Knowles Family Director of Golf Conrad Ray is expected to start a lineup featuring freshman Patrick Rodgers, junior Andrew Yun, senior David Chung along with sophomore Cameron Wilson and and junior Steve Kearney. Freshman Patrick Grimes is expected to compete as an individual. Ray will not be accompanying the team, as his wife Jennifer is expecting their third child. The Cardinal is hoping for a fast start to the spring season against one of the nation's strongest fields, as the team sets its sights on returning to the NCAA Championships after coming up short in qualifying last year. Stanford made a strong statement in its first event of the year, capturing the 15-team Fighting Illini Invitational at Olympia Fields, thanks to top-five finishes by three golfers, including Rodgers, who became the first Stanford golfer since Tiger Woods to win his inaugural collegiate event. The Cardinal also had a strong showing at The Prestige at PGA West, finishing third in a 15-team field. Stanford closed out the fall season with a pair of seventh-place finishes at the Isleworth Intercollegiate Invitational and the Gifford Collegiate Championships, respectively. "One big takeaway from the fall is we had some really stellar results, starting at Olympia Fields, where Patrick Rodgers came right off his Walker Cup appearance to win the event," said Ray. "Yun finished third and Cameron Wilson was tied for the lead going into the final round before finishing fourth. "That was the great thing about the fall - we got strong contributions across the board." Ray is excited about the depth on this year's team, especially at the top of the lineup. "The teams that I've had that have been really successful are the ones who are deep and have every player contributing in some fashion or another. Having one guy carry the team is not a formula for success. Our goal this spring is to have each of our five guys play an active role." Rodgers enters the spring as the fourth-ranked player in the country, according to the Golfweek/Sagarin rankings. His presence adds tremendous depth to a lineup that features Yun, who earned first team All-American honors last season and Chung, who was a finalist at the 2010 U.S. Amateur. "I've been around the Stanford program for a lot of years both as a player and a coach and have seen a lot of world class players," said Ray. "I'm not sure if I have seen a player prepare himself better to get tournament-ready than Patrick Rodgers. He prepares himself and manages his game like a seasoned touring pro. "He pretty much didn't miss a shot in Chicago and won the event against a very strong field. But he also showed he can post scores when he's not playing his best, which is rare for a freshman. The sky is the limit for the kid." According to Ray, the next step for Yun, who earned first team PING All-America honors last year after carding seven top-5 finishes, is to close the door when he is in contention. "Winning is a acquired skill," said Ray. "You have to learn how to manage your emotions down the stretch on the back nine and know what you have to do to get in the house with a low score. Andrew's next big goal is to win. He's more fit and has a better handle on his mechanics. If he continues to stay patient, he is going to get through that door. "The exciting thing is when you have a year like Andrew had last season, your expectations change. He has set a high bar for himself." Chung is regaining his form that made him one of the top amateur players in the world two years ago when he won the North-South Men's and Western Amateur titles, along with a runner-up finish at the U.S. Amateur. "If you look back on David's career, he has had stretches where he has been up and down," said Ray. "He is more mature with his approach right now and the results will follow." Ray has also been pleased with the progress of Wilson and Kearney, two seasoned sophomores who played in every event during the fall. "Wilson hits shots that others can't hit and Kearney will compete to the end. We feel really good about where those two players are at right now." Following the Amer Ari Invitational, the Cardinal will have a short turnaround before it competes in the San Diego Intercollegiate Classic, Feb. 12-14. After an appearance at the Southern Highlands Collegiate Masters, March 9-11, the Cardinal will play host to the U.S. Intercollegiate at Stanford Golf Course, March 30-April 1. The Western Intercollegiate at Pasatiempo Golf Club precedes the Pac-12 Men's Golf Championships, set for Apr. 27-29 at Trysting Tree Golf Club in Corvallis, Ore.
Stanford Golf Course will also play host to the NCAA West Regionals from May 17-19. This year's NCAA Championships will be held at Riviera Country Club in Pacific Palisades, May 29-June 3.